“Il meglio è l’inimico del bene”—“The Perfect is the Enemy of the Good”—wrote Voltaire, the great French philosopher known for fighting for the freedom of expression. In regards to engaging a character-building program like SEALFIT, I take Voltaire’s quote to mean quit dithering and get on it. Rather than put off the start of your training by trying to make sure the training plan is perfect, launch yourself onto the path and make course corrections as necessary. By all means strive for perfection, but if you’re waiting around for a scientific study to prove to you that one training program is superior to all others, then you might as well forget it and spend your time on something else, because that day is never going to come. If you’re new to SEALFIT Training, you should know that as it’s designed to develop your capacity to do work. A high level of ‘work capacity’ means you have the ability to do tremendous amounts of work in short, furious bursts of speed. For a SEAL, this work capacity is the foundational currency critical to preparing for a life-and-death mission. You don’t see SEALS at a fancy fitness center pumping up their biceps with arm curls on some polished-chrome machine. You’re more apt to find him using a pull-up bar, a sandbag or loaded barbell in a gym or being smoked with nonstop bodyweight exercises, like push-ups, burpees and man-makers, on the parking-lot style Grinder that the SEAL compound is known for. To develop work capacity, the SEAL sticks to functional movements that recruit muscles and combinations of muscle groups throughout the body, power flowing from the core through the extremities, that improve his ability to lift, pull, throw, run and fight. Throughout our experience, we’ve realized that regular (non-SEAL) men and women can benefit from participating in the same physical and mental training techniques that Navy SEALs undergo. By no means is this training regimen easy, but if you are serious about improving yourself mentally, physically, and emotionally, this is the program for you. Do You Have What it Takes to Become SEALFIT? 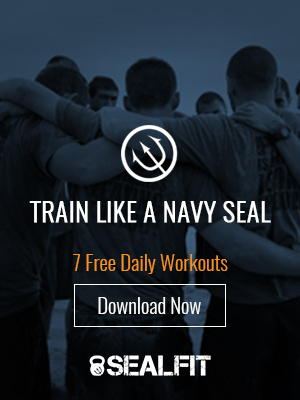 Do you want to know if you have the right stuff to become SEALFIT? Let’s find out right now—conduct the SEALFIT Screening Test. Right now—this is where you find out if you’re ready to commit not just to a training program but a way of life. Perform as many pushups as you can in 2 minutes. Perform as many sit-ups as you can in 2 minutes. Perform as many air squats as you can in 2 minutes. Perform as many pull-ups as you can without coming off the bar. Run 1.5 miles for time. Record all of your numbers and times in your journal. …So how do you feel? Were you able to complete the SEALFIT Screening Test? If not, don’t be discouraged. We’ve seen some of the toughest men and women struggle to complete these tasks back-to-back. With consistent training and practice, you will begin to see a noticeable improvement in both your endurance and stamina levels and your mindset. If you were able to complete the SEALFIT Screening Test (regardless of the numbers you recorded), then you should consider participating in SEALFIT Basic Training. Not only will you see these initial numbers improve, but you will grow mentally and emotionally as well. Develop Mental Toughness: This is a concept that applies to everyone (not just Navy SEALs). Mental toughness is something that everyone needs, but not everyone has. It is what gets you through challenging situations when all you want to do is quit. It is what allows you to be the bigger person in confrontations with others. It is what will help you step up and be a leader in your personal and professional life. Get Physically Fit: At SEALFIT Basic Training, you will participate in exercises that will push you to your limits, both physically and mentally. Whether you want to lose some weight, gain muscle, or increase your stamina, SEALFIT Training will help you reach your goals. Connect with Yourself on a Deeper Level: SEALFIT Basic Training involves more than vigorous exercise and classroom time. You will also have time for meditation and participate in drills focused on emotional control and intuition. You will find that by connecting with yourself on a deeper level will give you a new sense of purpose. So you think you have what it takes? Enroll in one of our events and you will never look back.